In this Japanese name, the family name is Matsuo. Matsuo Bashō (松尾 芭蕉, 1644–1694), born 松尾 金作, then Matsuo Chūemon Munefusa (松尾 忠右衛門 宗房), was the most famous poet of the Edo period in Japan. During his lifetime, Bashō was recognized for his works in the collaborative haikai no renga form; today, after centuries of commentary, he is recognized as the greatest master of haiku (then called hokku). Matsuo Bashō's poetry is internationally renowned; and, in Japan, many of his poems are reproduced on monuments and traditional sites. Although Bashō is justifiably famous in the West for his hokku, he himself believed his best work lay in leading and participating in renku. He is quoted as saying, "Many of my followers can write hokku as well as I can. Where I show who I really am is in linking haikai verses." Bashō was introduced to poetry at a young age, and after integrating himself into the intellectual scene of Edo (modern Tokyo) he quickly became well known throughout Japan. He made a living as a teacher; but then renounced the social, urban life of the literary circles and was inclined to wander throughout the country, heading west, east, and far into the northern wilderness to gain inspiration for his writing. His poems were influenced by his firsthand experience of the world around him, often encapsulating the feeling of a scene in a few simple elements. Bashō's supposed birthplace in Iga Province. Matsuo Bashō was born in 1644, near Ueno, in Iga Province. The Matsuo family was of samurai descent, and his father probably was a musokunin, a class of landowning peasants granted certain privileges of samurai. Little is known of his childhood. In his late teens, Bashō became a servant to Tōdō Yoshitada (藤堂 良忠) probably in some humble capacity, and probably not promoted to full samurai class. It is claimed he served as cook or a kitchen worker in some near-contemporaneous accounts, but there is no conclusive proof. A later hypothesis is that he was chosen to serve as page (koshō [ja]) to Yoshitada, with alternative documentary evidence suggesting he started serving at a younger age. In 1665, Bashō and Yoshitada together with some acquaintances composed a hyakuin, or one-hundred-verse renku. In 1666, Yoshitada's sudden death brought Bashō's peaceful life as a servant to an end. No records of this time remain, but it is believed that Bashō gave up any possibility of samurai status and left home. Biographers have proposed various reasons and destinations, including the possibility of an affair between Bashō and a Shinto miko named Jutei (寿貞), which is unlikely to be true. Bashō's own references to this time are vague; he recalled that "at one time I coveted an official post with a tenure of land", and that "there was a time when I was fascinated with the ways of homosexual love": there is no indication whether he was referring to real obsessions or fictional ones. He was uncertain whether to become a full-time poet; by his own account, "the alternatives battled in my mind and made my life restless". His indecision may have been influenced by the then still relatively low status of renga and haikai no renga as more social activities than serious artistic endeavors. In any case, his poems continued to be published in anthologies in 1667, 1669, and 1671, and he published a compilation of work by himself and other authors of the Teitoku school, The Seashell Game (貝おほひ, Kai Ōi), in 1672. In about the spring of that year he moved to Edo, to further his study of poetry. Bashō meets two farmers celebrating the mid-autumn moon festival in a print from Yoshitoshi's Hundred Aspects of the Moon. The haiku reads: "Since the crescent moon, I have been waiting for tonight." Despite his success, Bashō grew dissatisfied and lonely. He began to practice Zen meditation, but it seems not to have calmed his mind. In the winter of 1682 his hut burned down, and shortly afterwards, in early 1683, his mother died. He then traveled to Yamura, to stay with a friend. In the winter of 1683 his disciples gave him a second hut in Edo, but his spirits did not improve. In 1684 his disciple Takarai Kikaku published a compilation of him and other poets, Shriveled Chestnuts (虚栗, Minashiguri). Later that year he left Edo on the first of four major wanderings. Bashō's private planning for another long journey, to be described in his masterwork Oku no Hosomichi, or The Narrow Road to the Deep North, culminated on May 16, 1689 (Yayoi 27, Genroku 2), when he left Edo with his student and apprentice Kawai Sora (河合 曾良) on a journey to the Northern Provinces of Honshū. Bashō and Sora headed north to Hiraizumi, which they reached on June 29. They then walked to the western side of the island, touring Kisakata on July 30, and began hiking back at a leisurely pace along the coastline. During this 150-day journey Bashō traveled a total of 600 ri (2,400 km) through the northeastern areas of Honshū, returning to Edo in late 1691. On his return to Edo in the winter of 1691, Bashō lived in his third bashō hut, again provided by his disciples. This time, he was not alone: he took in a nephew and his female friend, Jutei, who were both recovering from illness. He had a great many visitors. Rather than sticking to the formulas of kigo (季語), which remain popular in Japan even today, Bashō aspired to reflect his real environment and emotions in his hokku. Even during his lifetime, the effort and style of his poetry was widely appreciated; after his death, it only increased. Several of his students compiled quotations from him about his own poetry, most notably Mukai Kyorai and Hattori Dohō. During the 18th century, appreciation of Bashō's poems grew more fervent, and commentators such as Ishiko Sekisui and Moro Nanimaru went to great length to find references in his hokku to historical events, medieval books, and other poems. These commentators were often lavish in their praise of Bashō's obscure references, some of which were probably literary false cognates. In 1793 Bashō was deified by the Shinto bureaucracy, and for a time criticizing his poetry was literally blasphemous. In the late 19th century, this period of unanimous passion for Bashō's poems came to an end. Masaoka Shiki, arguably Bashō's most famous critic, tore down the long-standing orthodoxy with his bold and candid objections to Bashō's style. However, Shiki was also instrumental in making Bashō's poetry accessible in English, and to leading intellectuals and the Japanese public at large. He invented the term haiku (replacing hokku) to refer to the freestanding 5–7–5 form which he considered the most artistic and desirable part of the haikai no renga. Critical interpretation of Bashō's poems continued into the 20th century, with notable works by Yamamoto Kenkichi, Imoto Nōichi, and Ogata Tsutomu. The 20th century also saw translations of Bashō's poems into languages and editions around the world. The position of Bashō in Western eyes as the haiku poet par excellence gives great influence to his poetry: Western preference for haiku over more traditional forms such as tanka or renga have rendered archetypal status to Bashō as Japanese poet and haiku as Japanese poetry. Some western scholars even believe that Bashō invented haiku. The impressionistic and concise nature of Bashō's verse greatly influenced Ezra Pound, the Imagists, and poets of the Beat Generation. Two of Bashō's poems were popularized in the short story "Teddy" written by J. D. Salinger and published in 1952 by The New Yorker magazine. In 1979, the International Astronomical Union named a crater found on Mercury after him. Matsuo, Bashō; et al. (1973). Monkey's Raincoat. trans. Maeda Cana. New York: Grossman Publishers. SBN 670-48651-5. ISBN 0670486515. ^ Louis Frédéric, Japan Encyclopedia, Harvard University Press, 2002, p. 71. ^ 松尾芭蕉 (in Japanese). The Asahi Shimbun Company. Retrieved 2010-11-22. ^ 芭蕉と伊賀上野 (in Japanese). 芭蕉と伊賀 Igaueno Cable Television. Retrieved 2010-11-22. ^ a b c Carter 1997, p. 62. ^ Ueda 1992, p. 17. ^ Ueda 1982, pp. 17–20. ^ Nihon Jinmei Daijiten Plus 2015. ^ Kon 1994, p. 12. ^ Ichikawa Danjūrō II's diary Oi no tanoshimi says "cook"; Endō Atsujin (遠藤曰人)'s biography Bashō-ō keifu "kitchen-worker". ^ Hibino 1978, p. 28. ^ Ueda 1982, p. 21. ^ Ueda 1982, p. 22. ^ Ueda 1982, p. 23. ^ Ueda 1982, p. 9. ^ Carter 1997, p. 62. ^ Ueda 1982, p. 25. ^ Ueda 1992, p. 95. ^ Ueda 1982, p. 26. 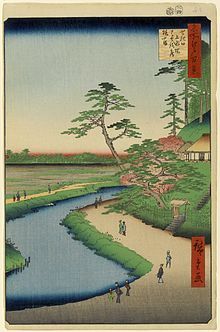 ^ Examples of Basho's haiku written on the Tokaido, together with a collection of portraits of the poet and woodblock prints from Utagawa Hiroshige, are included in: Forbes and Henley, 2014. ^ Ueda 1992, p. 122. ^ Ueda 1982, p. 29. ^ Kokusai 1948, p. 241. ^ Bolitho, Harold, in Treasures of the Yenching: seventy-fifth anniversary of the Harvard-Yenching Library, Chinese University Press, 2003, ISBN 978-962-996-102-2 p. 35. ^ Ueda 1992, p. 34. ^ Kikaku, 2006, pp. 20–23. ^ Ueda (1970), p. 50. ^ a b c d e Ueda 1992, p. 7. ^ Burleigh, David 'Modern Haiku Review' vol 35.2, Summer 2004, Lincoln, United States. ^ Shirane (1998), p. 37. ^ Ross, Bruce. How to Haiku: A Writer's Guide to Haiku and Related Forms, Tuttle, 2002, ISBN 978-0-8048-3232-8, p. 2. ^ See, for instance, Lawlor 2005, p. 176. ^ Slawenski, 2010, p. 239: "Nothing in the voice of the cicada intimates how soon it will die" and "Along this road goes no one, this autumn eve." ^ International Astronomical Union (30 November 1980). Transactions of the International Astronomical Union, Volume XVIIB. Springer Science & Business Media. p. 291. ISBN 978-90-277-1159-5. Carter, Steven (1997). "On a Bare Branch: Bashō and the Haikai Profession". Journal of the American Oriental Society. 117 (1): 57–69. doi:10.2307/605622. JSTOR 605622. "Tōdō Sengin" 藤堂蝉吟. Nihon Jinmei Daijiten Plus (in Japanese). Kodansha. 2015. Retrieved 2018-03-26. Kokusai Bunka Shinkōkai (1948). Introduction to Classic Japanese Literature. Tokyo: Kokusai Bunka Shinkōkai. Wikimedia Commons has media related to Matsuo Basho. "Matsuo Bashō (松尾芭蕉)". Classical Japanese Database. Retrieved 2008-05-12. Various poems by Bashō, in original and translation. "Interpretations of Bashō". Haiku Poets Hut. Archived from the original on 2002-07-09. Retrieved 2008-05-12. Comparison of translations by R. H. Blyth, Lucien Stryck and Peter Beilenson of several Bashō haiku. Norman, Howard (February 2008). "On the Poet's Trail". National Geographic Magazine. Retrieved 2008-05-12. Interactive Travelogue of Howard Norman's journey in Basho's footsteps, including a map of the route taken. "An Account of Our Master Bashō's Last Days". Simply Haiku: A Quarterly Journal of Japanese Short Form Poetry. Retrieved 2008-06-29. A translation by Nobuyuki Yuasa of an important manuscript by Takarai Kikaku, also known as Shinshi, one of Bashō's followers. "Matsuo Bashō - Complete Haiku in Japanese". André von Kugland. Retrieved 2010-01-09. Price, Sean (2007). "Phinaes' Haikai Linked Verse Translations". Archived from the original on 2007-12-31. Retrieved 2009-11-02. 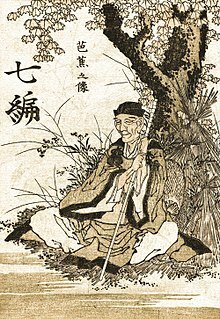 Translations of renku by Bashō and his disciples, by Sean Price. Norman, Howard (February 2008). "On the Poet's Trail". National Geographic Magazine. Retrieved 2008-05-12. Travels along the path Matsuo Bashō followed for Oku no Hosomichi. Photography by Mike Yamashita.